How to blog and be healthy? 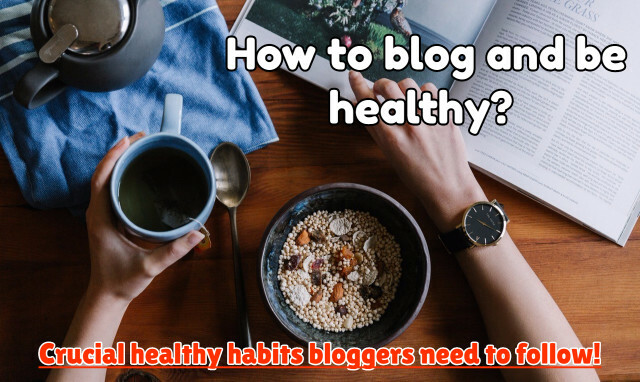 Crucial healthy habits bloggers need to follow! Innovation can be demanding. When you’re on a roll with your ideas, there is just no stopping. But sometimes it is important to take a step back to move forward. That is what we’re going to talk about today. There are times when a pause becomes necessary. Procuring healthy habits is a very important factor for every writer. After long stretches of sitting, the body requires some work. There are side-effects of sitting for too long. Slower Metabolism – This leads to rapid increase in body fat due to less expenditure of energy. Also, the body’s fat burning capabilities are reduced. Obesity – As you get more prone to gain weight, there is a high chance that you may fall victim to obesity. This leads to an entirely new series of illnesses related to obesity. Increase in insulin resistance – When the body is idle for too long, its capacity to process sugar decreases. This may lead to Type II diabetes. Cardiovascular diseases – The heart rate slows down due to long inactiveness. The heart suffers from this and may lead to heart diseases. The only way to keep a well beating heart is to make it work hard at least once a day. Deep Vein Thrombosis – In a situation like this, it is likely that blood clots may form and which may cause obstruction to blood flow. This may lead to pulmonary embolisms. Cancer – When the body doesn’t function often, cancer may latch on to it. Now you can see how sitting for too long, is not at all a healthy habit. Sometimes when work compels us to sit for long periods of time, a weekend yoga session may not suffice. What the body needs is someone to take of it. In the workplace environment, satisfying others is not merely a mannerly act, but a compulsion. As a result, we get too lost in the needs of others, we forget to find what we want. Trapped in the cycle of helping others and not being reciprocated enough, we need time to ourselves. Rediscover yourself with that alone time you so desperately need. The best part of it is that it’s just you. No matter how senseless and crazy your thoughts and actions maybe, it’s just you. No more explaining or caring about what others may think. It is certainly a bliss to find that alone time. Wake up early before everyone else and have a warm cup of coffee and breakfast and let the brain go berserk. It’s from the strangest of ideas, the great ones are born. Pamper yourself after work. Remember, you deserve it. The biggest excuse for avoiding healthy habits is time. Time is always there in between gaps. We just tend to be lazy, so we miss the extra time which we could’ve utilized in a much better way. To avoid this, plan your day. It’s a simple act. Just jot down your activities the next day. Keep a target time in your schedule within which you plan to execute your tasks. After it is done, you will find yourself with ample amount of time for yourself. In this time, relax. Enjoy life. Or pick up something you always wanted to do. One you get into the practice of planning your day ahead, it becomes a well-needed addiction. Keep your cool when things don’t go according to plan. You can always check your schedule yourself and make proper adjustments. A planned series of activities occur much more smoothly than an impulsive series of actions which require more effort but yields fewer results. The occasional Cheetos with cheese dips and fries to satisfy our appetite of the stomach and heart is fun. But regularly indulging in them is not at all good for the body. Eating food with high oil content harms the body is several ways. Firstly, a blogger who sits for long hours and does his work is prone to weight gain. On top of that, if he/she chooses to have a diet use as this, it shouldn’t come as a surprise if they fall victim to a disease. Having fresh vegetables and well-cooked food is good for the heart. Stuffing yourself with high-calorie food whenever you get a craving is definitely not a good idea. This leads to high cholesterol and heart diseases. 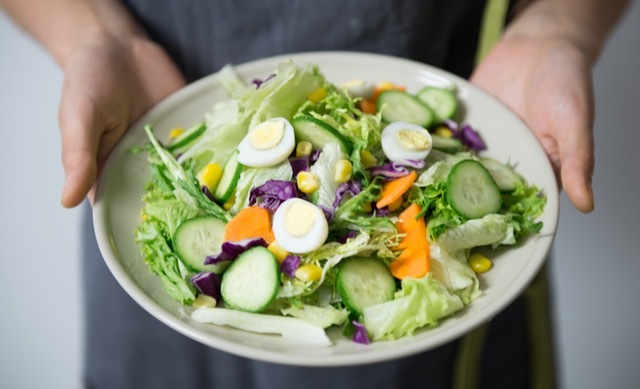 Healthy eating habits lead to a longer life and balanced body maintenance. A well-functioning body helps you to put up with those occasional long hours of extra time. When Money is the word, hard work comes attached with it. To work hard, you need a loyal body to stay with you. Maintain it. Take care of it. Have proper healthy eating habits. A Proper posture is the key to successfully staying on board with your long work hours. It portrays confidence. A person with good body language and proper posture is always seen in a good manner. It makes breathing in and out easier as well. The flow of air into and out of our lungs is directly related to our posture. People with good posture have been blood circulation and better digestion. This results in a healthier body and a healthier mind. The muscles and joint of your body are utilized during good postures. If the muscles and bones are in proper alignment with each other, it reduces the chances of degenerative diseases, gives us more energy and prevents fatigue. Also, a healthy spine also leads to the better flow of blood and better movement. Hence, maintaining proper posture is a good health habit. This portion does not need a new introduction or excess emphasis. We all know the importance and necessity of a good workout session. There have been numerous occasions when we used silly excuses to avoid working out. Not anymore. That’s what you have to say to yourself if a better lifestyle is what you wish for. Make regular a non-negotiable part of your routine. Start small. Make a set chart and go ahead. Start stretching and jumping. Feel the increased blood flow and the rise in energy level. Don’t expect results till you’ve made this a habit. You can feel your heart becoming free from all the pressure and workload. Take a walk or jog. Lift weights regularly. It not a question of how much you work a day. It is about maintaining it regularly. Work hard till it feels natural. Then it will have become a healthy habit. Maintain the body to maintain the soul. Now that you know the various types of problems that may arrive due to long works of physical idleness and the steps you can take to free your body and soul from its hazards, I hope you consider it seriously. We bloggers, always show people the correct way to do things, so it’s time for us to practice what we preach. Working for long hours is indeed a commendable notion. But sacrificing ourselves to the cause is not worth it. We need to balance our priorities, else both are lost. A person who cannot maintain a healthy habit will face its consequence sometime or the other. So, keep writing but also take care of yourself. No one else will. By the way if you want more information on healthy living, you may follow my wellness blog. I think the deadliest thing about blogging is that it is so flexible in time requirements, many bloggers would tend to work late into the night or really odd hours. Doing the things you mentioned would thus be even more important.